Watch review Waltham Vintage, High Beat. I picked this one up on impulse, along with a quartz Seiko. 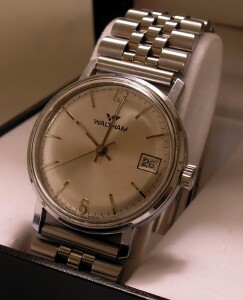 It is a surprisingly clean watch, with a 8 bps movement (28,800 BPH) that keeps great time. I have not even polished the crystal. Just removed some dirt and put it on a metal bracelet. The dial is a silver, radial sunburst with Arabic markers at 12 and 6. At the 3 o’clock position is the date. The applied hour markers are stick and appear to be rhodium plated, like the Arabic markers, with a luminous dot. The minute markers are simple, printed black markers. The hands are simple sticks, with Tritium paint luminous material. Overall, the dial design is understated simplicity. The Waltham name is accented with a stylized W, which pops against the dial. The crown is signed with a large W and has all of the original plating. The crown is also pleasantly over-sized and easy to wind. The case is base metal, with a high polished, chrome plated finish. It is a smaller, 34mn diameter case, with 17mm lugs. The case back is stainless. The chrome plate has no wear through. The crystal is a lightly domed acrylic, with no cracks and very little scratching. The movement is a 7 jewel, high beat movement at 28,800 BPH. I opened up the back of the watch and the movement is spotless with no signs of water or dust. It is keeping very accurate time, as to be expected with a high beat. The power reserve looks to be about 40 hours as well, so no need for servicing soon. This is my second Waltham watch, and I am very pleased with it. It is a shame they went out of business, the styles and quality are excellent, from all the pieces I have handled so far. I put it on a Jubilee style metal bracelet, which works well with the watch. I don’t think it was worn all that much by the original owner, since the plating is in excellent shape and the movement is performing flawlessly. Case: 34mm, chrome plated base metal, water reistant. Back: Stainless Steel, snap on, claims water, shock, and dust resistant. Movement: Waltham Hi-beat 28,800 BPH movement, 7 jewels. Other: Stainless after market jubilee style . 17 mm lugs.